Shop #5 on the 2012 Boulder Caffeine Crawl was Boxcar Coffee Roasters. The business shares its location with Cured so don’t be confused when you walk in. Beverages are served to the left and food is bought to the right. This isn’t a steam engine. It’s an Ideal Rapid coffee roaster built in Germany in 1929 by Ferdinand Gothot Maschinenfabrik Gmbh. It’s built with heavy iron castings to keep the roasting temperature extremely stable. Vajra used his mechanical skills to restore and modernize it. 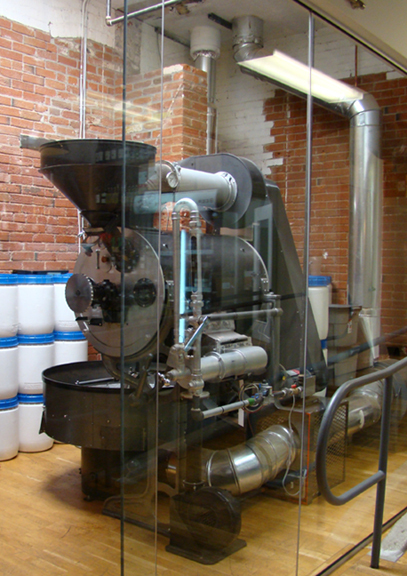 Roasting experts consider it one of the most unique roasters in the country. Vajra was set up to begin the demonstration when we walked in. He said they have a unique brewing method they call “cowboy coffee.” Just as the cowboys placed their grounds in water boiled over a campfire, Boxcar’s baristas immerse freshly ground coffee in 200-degree water taken from a special water dispenser. They continue to heat it in a large pre-heated lab beaker placed on a custom-built mantle. This mantle heats and tumbles the brew until a sweet smell rising from the grounds indicates it’s ready to pour. Baristas then drop in ice to settle the grounds and stop the “brew momentum” before pouring it through a strainer to create a rich, non-acidic, slightly sweet cup of coffee. Here’s a close view of the custom-built mantle Boxcar had to create in order to fit the round base of a typical oversized lab beaker. Once the beaker is in place, they continue heating it to a low boil (203 degrees in Colorado), so they can produce the “cowboy coffee” described above. The crawl walkers were eagerly waiting to enjoy their fifth caffeine fix for the day! Because Boxcar’s method produces such a rich, heady brew, it is especially good poured over ice. Perry usually prefers hot coffee over cold, but he said this brew would get strong reviews from his iced-coffee-drinking cousins in Wisconsin!